(SEMASA) AMERICAN TOURISTER® ENCOURAGES YOU TO BRING BACK MORE! Kuala Lumpur, 24 July 2018 – American Tourister®, one of the most trusted and renowned travel brands embarked on a unique campaign to put the joy back into travelling while allowing its consumers to ‘Bring Back More’ from their travels. Simply titled “Bring Back More”, the campaign runs until the end of the year and accentuates the best part of travelling is what is brought back from the journey. As part of the campaign, every purchase of regular priced medium / large-sized American Tourister® luggage, will entitle customers to receive a RM 50 voucher for their baggage allowance while stocks last. The promotion period will run from August 15 until the end of 2018. Since its inception in 1933, American Tourister® has grown to become one of the most trusted and recognised brand names with a heritage that spans more than 80 years. The brand’s commitment to offering durable and affordable luggage began in the 1930s and continues to the present day, marrying superior quality with contemporary, trendy designs with great value, offering a wide selection of travel gear for travelers from all walks of life. Today, American Tourister® offers an extensive collection of value for money luggage that embodies the vibrant and fun positioning of the brand. “Part of our success today is owed to the strategic partnerships that we have forged and a unique brand positioning, which help propel our brand forward. 2018 is an especially significant one for the American Tourister® brand with a vast array of game-changing partnerships, exciting product lines and a distinctive positioning encouraging customers to bring back more from each and every journey, which brings us all here today for this truly unique event,” said Mr. Satish Peerubandi. Still hot off the excitement of the recently concluded World Cup, Peerubandi also announced the signing of international football superstar and fashion icon, Cristiano Ronaldo as the Brand Ambassador for American Tourister®. “Dynamic, stylish and confident, Ronaldo embodies the soul of American Tourister – a functional yet cool brand that appeals to people from all walks of life and from around the globe. The brand represents the epitome of fashion-chic luggage and embodies the characteristics of the effervescent, spirited and adventurous with a zest for life – much like the game of football, which is why we couldn’t think of a more fitting person that Ronaldo to be our Brand Ambassador,” said Peerubandi. Meanwhile, Ambert Khoo added that the campaign ties in with the brand’s unique offering and value to customers. 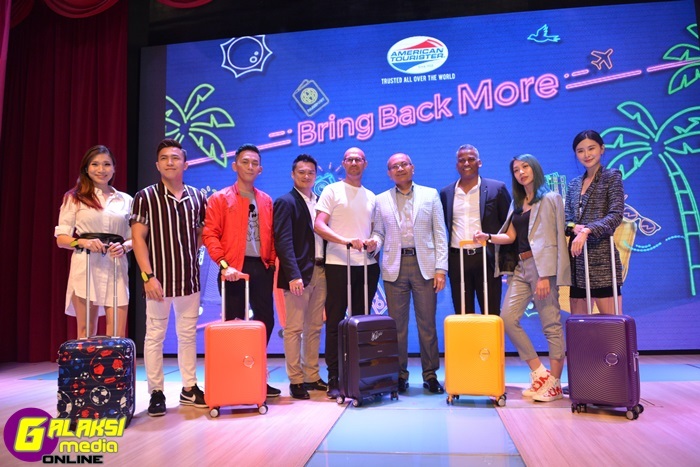 “In its simplest form, American Tourister® is a brand that reflects the joy of travel and that joy is self-evident in what you bring back from any travel experience hence our campaign positioning of ‘Bring Back More,” said Khoo. “In line with this theme, we have organized what we believe to be a rather unique campaign running until the end of 2018, exciting and energizing consumers to get on board the wonderful world of travel with American Tourister®,” he added.